The New Homes Guide is published bi-monthly and contains the most comprehensive listing of new homes and new home communities in South Texas’ growing Rio Grande Valley. Each issue features some of the area’s leading builders of fine homes and the vendors and suppliers of new home products that give the homes their flare. 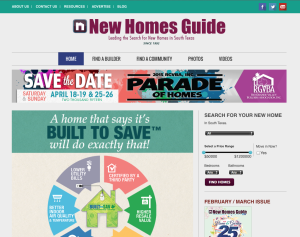 The New Homes Guide will take the guesswork out of finding an energy efficient quality builder. Custom-design your dream home or choose from move-in-ready homes in a variety of new home communities throughout the region. Download our New Homes Guide app, now available on iTunes and Google Play for new home shopping from your device. It’s easy, convenient, and free.